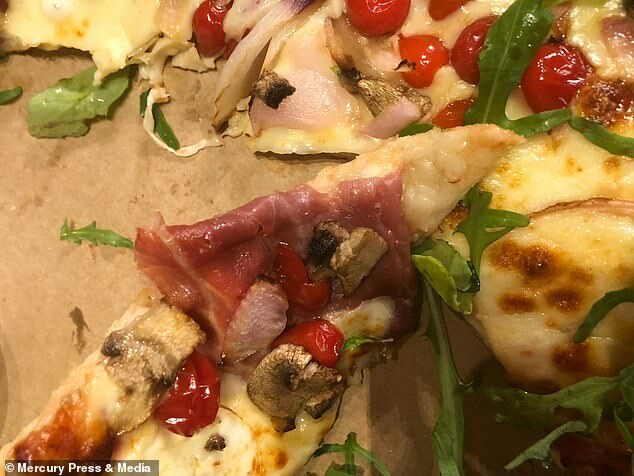 A vegetarian who had never eaten meat says she was physically sick after Domino's delivered her the wrong pizza which was 'smothered in ham'. 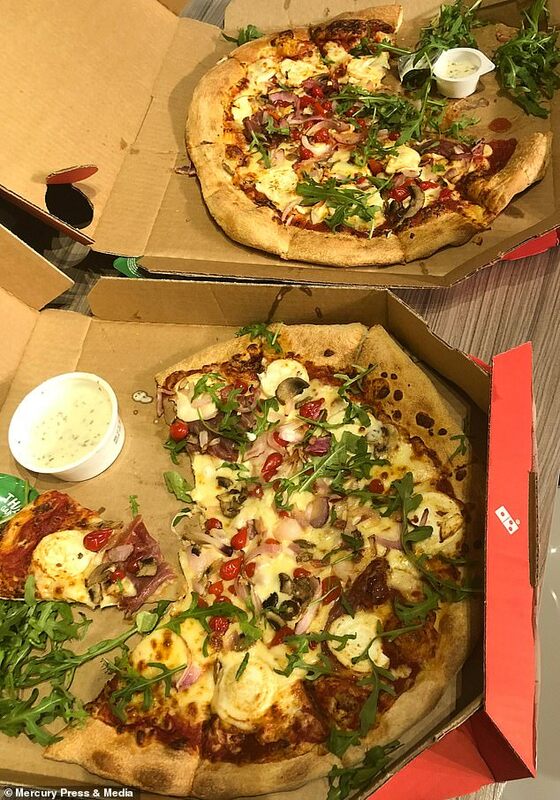 Shannon Rich, 22, says she and her partner Paul Davies, 22, ordered two vegetarian Roma pizzas for dinner from Domino's on Malpas Road in Newport, South Wales. When the pizzas arrived Miss Rich claims she was so hungry she tucked into her meal straight away and ate two slices before making the shocking discovery of ham. The university student says the horrific discovery has left her 'paranoid' and she has been put off pizza for life. Miss Rich said: 'We ordered the pizzas and when they came they were literally smothered in ham. 'We were hungry when it arrived and when I opened it I just bit into it - I never saw meat on the pizza before I ate it. 'I ate two slices and then I looked and saw there was meat on there. 'I asked my partner and said 'oh my god is that meat?' Then he opened his again, he'd eaten some of his and there was meat on his too. It made me physically sick. 'It didn't even smell like meat. I was hungry and just indulged in it - I ate two slices. 'I didn't know it was on there. It was hidden and I don't even know what meat tastes like. 'When I noticed, I ran to the toilet and tried making myself be sick to just try and get it up. 'My boyfriend just ate the two slices too, but he's not as bothered as I obviously am because he's not been veggie his whole life. Miss Rich, who placed the order online, alleges that the delivery was taking longer than usual and says she rang the store to chase it, reiterating that there were two vegetarian pizzas. She said: 'It would normally take 45 minutes to an hour to get to us - but this time it did take a while. The alleged ordeal has left Miss Rich so 'paranoid' she says she now checks every single thing she eats to make sure there's no hidden meat in it. 'It's affected me now because I'm scared with food. I'm just constantly checking it. 'It has made me constantly paranoid. I won't eat out now and I didn't eat for a while after that as it just made me ill.
After the shock, Miss Rich called the Domino's store back to tell them there was meat on the pizza and claims they dismissed her allegation telling her that was what she had ordered. Miss Rich posted a picture of the pizza on social media to express how upset she was with the situation. The student claims Domino's responded by offering her free pizza and that they would be sending an area manager to the store to investigate, but Shannon says she'll never touch Domino's pizza again. Miss Rich said: 'I told them multiple times they were veggie pizzas. Obviously it was on the order and then when I rang them because they were late and I reiterated it. 'I rang back when I found meat on it and the lady who answered said the order came to them saying 'with meat' on - she didn't seem too bothered at all. 'I double checked my order just in case I made that mistake but I hadn't. It was supposed to be veggie and that was it. 'After I posted online, Domino's said they were sorry that it happened and that it's going to be investigated and that's it really. 'None of that is going to change what has happened and how I feel. 'Their response made me feel quite upset because they obviously don't care, they just think that offering free food is going to make everything better but it's just not. 'I haven't eaten pizza since and probably won't eat pizza again - not even shop-bought pizza. 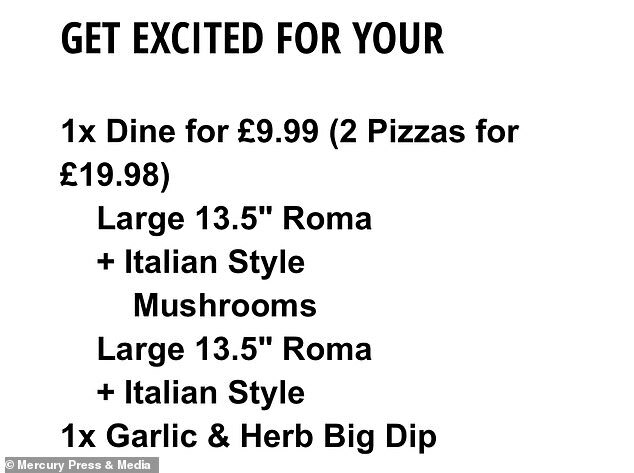 I'd never again order from Domino's again, it's put me off pizza for life. Domino's said Miss Rich has been 'reluctant to cooperate' with their attempts to investigate the allegations. Louise Butler, a spokesperson for Domino's, said: 'Upon receiving the allegation we immediately offered to collect the pizza to investigate, but Ms Rich was unfortunately reluctant to cooperate.